To date, it was normal for the first two parameters to use simulacrum made in the most disparate materials that reproduce, more or less faithfully, the size and shape of a knife. For the third parameter (for those interested in knowing where the knife hit the opponent's body during training) it is usual to use dirty simulacrum with colored plaster or other pigments. In some cases, mostly for public demonstrations, it was normal to use a pen marker as a knife surrogate. AKU STRIKE meets all of these requirements with a tool that combines the low level of harmfulness of a polymers trainer knife, with an electronic circuit that visually and acoustically signals the blade contact with the practitioner's body. When the blade tip or cutting edge is pressed, the LED on ricasso is lit and / or a sound is emitted. It is possible to choose between the color of the LED (red or green) through the selector switches on the back of the handle, and also to activate a beeper alert (which is different for the two colors). During competitions the double acoustic / visual signaling allows the referee to attribute the "point" performed by one of the two contestants. In this specific area of knife fencing, the MIMIC T-16 is definitely an indispensable and well-made instrument. In other training contexts, such as the "flow-drills" typical of the Filipine Martial Arts and the activities of "tapi-tapi" (training for the contemporary use of the arms in unprepared schemes), having a trainer who actively signals blade contact with the partner is not too relevant, but in this case the MIMIC T-16 can be used by turning off the beeper and leaving only the LED light on. It may be, however, much more useful and fun, to use double signaling during sparring activities. The handle, made in safety blue colored glass filled nylon, is well dimensioned but from the ergonomic point of view is not so exceptional. Even though all the handle edges have been beveled, it is still too squared (especially the index finger groove); it is clearly a carefully valued choice tied to constructive needs, but we could not completely ignore this aspect. However, the handle is well-designed when using bulky training gloves. In addition, the knife features a low profile belt clip which is useful to comfortably clip it to the outside of pants during training (instead of throwing the knife on ground) when a training phase does not require the use of the instrument. The clip may simply be removed by unscrewing the three hexagonal screws that holding it fastened to the handle. 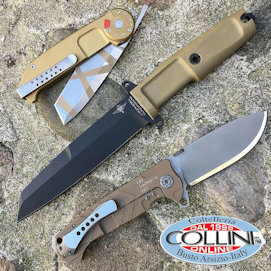 The MIMIC T-16 can be equipped with a kydex sheath (available separately on the official website of the manufacturer at the price of $ 39.95) which also offers the possibility of simulating the extraction of a fixed blade knife during training. On the terminal part of the handle is placed the battery seat (two type 2032, included with the knife) that opens after unscrewing the Phillips screw on the side of the clip. The knife is also equipped with a large lanyard hole which, as indicated by the manufacturer, is used to secure the knife on the wrist to prevent damage, that could occur in case of being dropped on hard surfaces. At the same time, thanks to its particular shape, the large lanyard hole also acts as a stop for the hand (as an additional measure to limit the possibility that the knife slips from the hand). The MIMIC T-16 is very light, with its 79 g (0.35 lbs), and is comparable to other traditional plastic trainer knives. 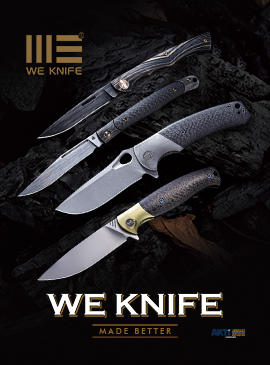 The choice of the trainer knife clearly has to be made according to the type of training, evaluating the compromise between the greater realism of the instrument and therefore with greater weight and stiffness - such as aluminum or steel knives - which, however, results in greater danger and therefore requires the use of protective equipment on all body, or you can opt for lighter and less harmful knives, as in the case of the MIMIC T-16, which however allow greater freedom and allow only eye protection to be used, increasing in this case the realism of training conditions. The retail price is of $ 41.95 for the clear blade version and $ 43.95 for the nickel plated blade version, and can be bought directly from the manufacturer's website. Overall, the MIMIC T-16 by AKU STRIKE demonstrates excellent potential and is extremely useful for competitions. At the same time, the use during training gives the practitioner more input on every single hit and can have a didactic function but, above all, it makes the training more fun.